Ha ha ha ha ha haa! SPIN IT! Following the success of Ducktales and Rescue Rangers, Disney stuck with what had now worked twice, taking an old character from their existing library and dropping them into a new situation. And following the daft conceptual escalation that had already gone from "Don Rosa's Duck comics, but with less Donald and more nephews" to "those two chipmunks who used to pester Donald Duck run a detective agency," we reach TaleSpin, in which Baloo the bear from The Jungle Book is a dieselpunk seaplane cargo pilot in the days before World War II. You know, all the things kids love. In The Jungle Book, Baloo was already fairly anthropomorphic, so his transition to the TaleSpin Cinematic Universe mainly involved giving him some clothes and more human hands. Er, that is, "more human hands" as in "hands that are more human than before," not "more human hands" as in "he had a collection of human hands and we have helped him increase the size of that collection." Although honestly, a pile of loose human hands is not that outside the realm of possibility for something a bear might have. Or a serial killer. Or a serial killer bear. Just like the kids love. Baloo is sculpted in a pretty simple, straightforward pose, just standing around with his hands (his hands, not the loose human hands he's been collecting) on his hips. But what else could they do? He doesn't dance as much in TaleSpin as he did in Jungle Book, and there's no point in making him sit down if you're never going to release his plane, the Sea Duck (which was originally designed for a scrapped DuckTales plot in which Launchpad McQuack would run his own cargo service). 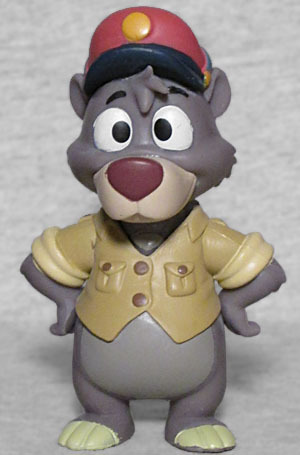 Baloo is available in a 1:36 ratio, meaning he's in every third case, alternating his spot with Gadget Hackwrench and the two 1:72 figures (Monterey Jack and Morgana Macawber).